A big china mug of tea and a free chocolate biscuit make for a fine walk! 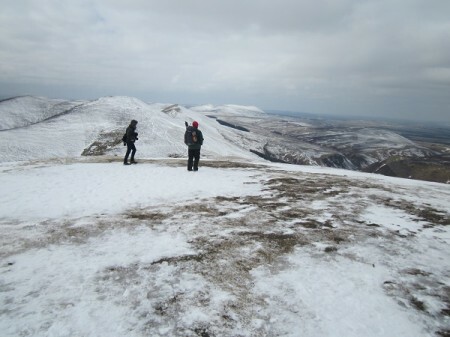 This time last week we were standing atop Carnethy Hill in the Pentlands Hills just to the south of Edinburgh. 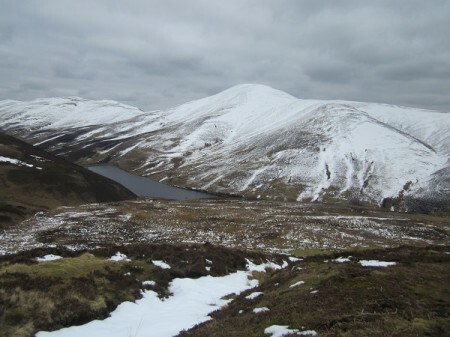 The upper slopes of the hills still had a lot of snow on them that broke into patches lower down and disappeared altogether once down in the glen. For the most part there was an almost completely overcast sky but this helped to make the snow covered hills stand out, so it was almost perfect conditions for me. We’d met up with the photographer Daniel Thornton at about half past nine and he was to join us for the first few hours of our walk. He had a meeting at 4pm in Edinburgh and so planned to head off north across to a road on that side of the hills to catch a bus back. Dan is a landscape photographer and it was interesting hearing him talk about his work and the kind of things that interest him in the landscape. He said he liked my incredibly slow pace of walking as it allowed him plenty of time to take his photos without worrying that he was holding anyone else up! The views that day really were wonderful and with the air so cold and clear even I could make out the snow covered hills further to the south and an even bigger view to the north and west. It was a perfect day for a walk with either photos or paintings in mind. The snow underfoot was almost perfect for walking on, soft enough to get some grip but not too soft that you sank into the drifts …it was great! By the time we’d reached the wee bealach between Carnethy Hill and Scald Law, Dan said that it was time for him to make a dash for the bus and so after a quick goodbye and a promise to give him a shout next time we were heading up to the Highlands, we went to find ourselves a lunch spot and Dan disappeared down into the glen. Apparently, despite stopping to take numerous photos he made his meeting with 20 minutes to spare. 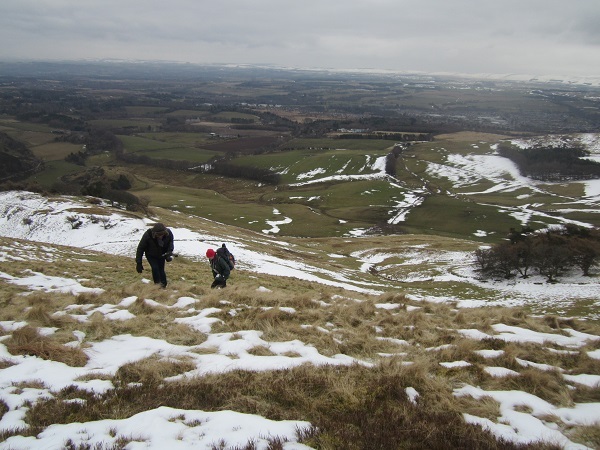 When we were last in these hills we continued up and over Scald Law and on to East Kip before descending into the glen for the walk back to the car. I had at the time thought that it would be interesting to get up on top of Black Hill. 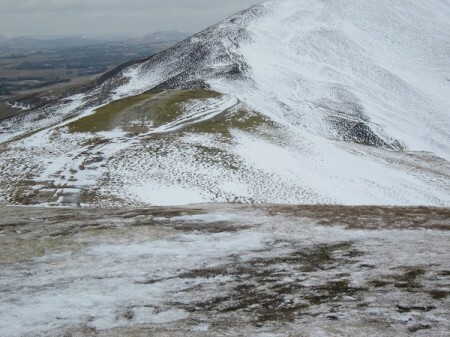 This is the long whale back of a hill that lies on the north side of the glen opposite the main Pentland ridge…..it should give really fine views of where we’d just walked. So then, that’s what we did. Our route to the tea shop! After a leisurely lunch in a patch of sun that had appeared from nowhere, we followed the path Dan took down into the glen. There was not much path to start with as the snow was so thick that only the top few inches of the fence posts were sticking above the white stuff! We were however, quickly down into the bottom of the glen and out of the snow. Further patches of sun were starting to appear and what had been a cold and very wintry scene higher up, was now much more spring like, especially with lambs in the fields and the grass looking decidedly green in the sun. At first we followed the glen west and then north as it narrowed between steep craggy little hills on one side and the steep stony slopes of Black Hill on the other. 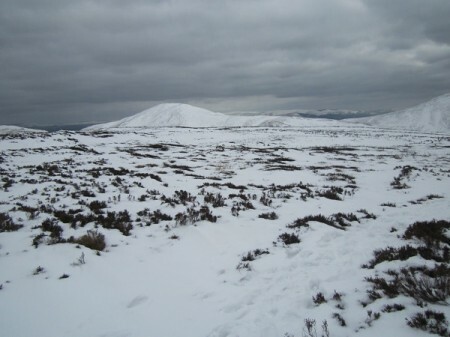 After about a kilometre we were able to cut very steeply up onto the back of Black Hill and then proceeded to walk all the way to its summit …just a slightly higher lump on this broad expanse of heather and snow covered hill …marked by a small pile of stones. As a place to view the main Pentland Hills ridge, this was perfect and we spent much time stopping to take photos and simply stare at this beautiful winter scene. Our route back down into the glen was a fortuitous one indeed. We’d originally planned to follow a path marked on the map, but with all the snow it was almost impossible to find and so Nita made a curving route down to join the track by the reservoir …probably a little further than if we’d taken the path but at a much easier gradient. The point though, was that we joined the track just where a small portacabin had been set up to sell hot and cold drinks to the fishermen who visit the reservoir. We couldn’t believe our luck..it was open! Nita went in and returned five minutes late armed with two big china mugs of tea and a free chocolate biscuit each! Her day was made ..as was mine, and we stood by the side of the reservoir in what had now become bright late afternoon sunshine, drinking our tea with the snow covered hills rising all around us. It was perfect. 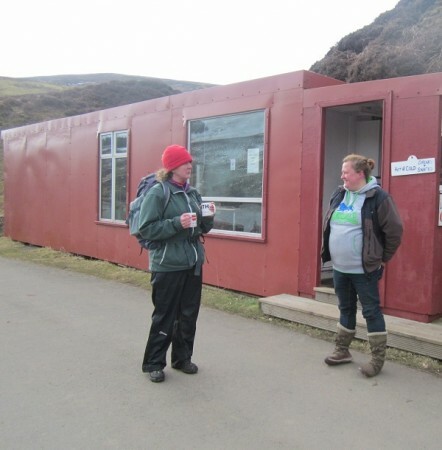 If you’re walking here do check this little tea shop out…..it makes a perfect walk even more enjoyable!